Gum disease is a serious oral issue and it happens more often than you may think. The scariest part about gum disease is that it is silent when it first starts, which means that you may not recognize the warnings signs until the disease has progressed. Many patients have no ideal that they even have gum disease until their dentist or hygienist tells them at their regularly scheduled dental appointment. After gum disease comes periodontal disease and it only takes a small amount of time until the symptoms show and at this point, they are often irreparable. Gum disease is also referred to as periodontal disease and it is the number one cause of tooth loss in adults. There are several stages of the disease and all begin with an infection of the gums which then works its way into the bones and elements. The first stages of gum disease are often detected at a regularly scheduled dental appointment, as we mentioned briefly above. If you do not have the gum disease treated in a timely manner, it will continue to get worse. The dentists at Thornton Town Center Family Dental want you to know that more than HALF of adults have gum disease and more than three-quarters of those 35 and older have periodontal disease. Below, our dentists will talk about some of the signs of periodontal disease, talk about the treatment available for it, and talk to you about receding gums. If you have any questions about gum disease or you would like to schedule an appointment, call our Thornton office today. The major cause of periodontal disease is plaque. When the plaque interacts with the bacteria in your mouth, they cause toxins to develop and these toxins work to irritate and inflame your gums. It is this process that then destroys your gum tissue and causes the gums to separate from one another. If you fail to seek out treatment at this stage, you will develop more severe symptoms. When plaque is not removed from your teeth it will form a substance known as tartar. This tartar can extend below the gum line and when it does, it irritates your gums even more. Only a dentist or hygienist can remove the tartar from your teeth. The dentists at Thornton Town Center Family Dental want you to call and schedule an appointment with our professionals to have your gums checked for periodontitis. You must understand that gum disease CAN be treated but the longer that you wait to have it treated, the worse the symptoms become. Gum disease is treated through a process known as root planing and scaling or a deep cleaning. The procedure is extensive and takes several office visits to complete. If you have deep pocket formation, you may require prescription medication to eliminate the gum disease. Gums that are receding or have receded are often alarming and you may be racking your brain trying to figure out what is going on. Many people think of it as a side effect of aging and while that may be one of the causes, it is not the only cause. In fact, periodontal disease is often the reason for receding gums and since 3 out of 4 adults over 35 have periodontal disease, it would not be uncommon for this to be the reason. As we have said before, the earliest stages of gum disease do not always show symptoms and the only symptoms you may experience include swollen or red gums. These are reversible however, if you allow the disease to progress, irreparable harm may be done. Gum disease destroys the tissues and bones in the mouth and can lead to tooth loss. Periodontitis is the main reason why most adults have missing teeth. Thornton Town Center Family Dental is ready to help you remain in good oral health and we can help you avoid periodontal disease. Our dentists treat gum disease through all stages and we can assist you in making sure your gums are free from disease. Whether you are in good oral health or you have noticed your gums are receding, we can counsel you on the proper ways to avoid gum disease. Our dentists treat gum disease as well and we can provide you with the care you need. 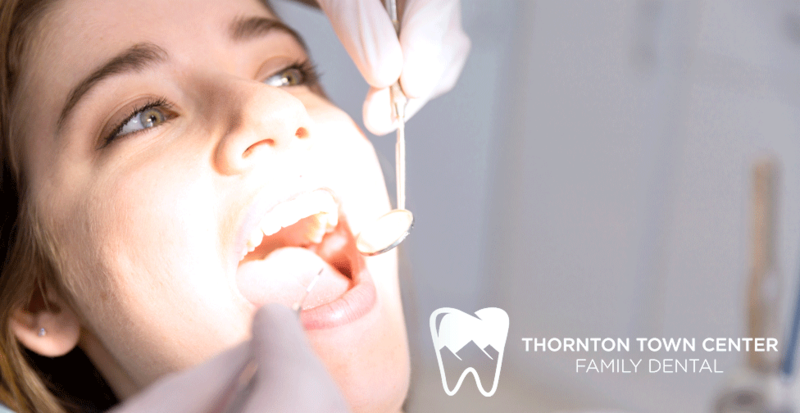 Don’t wait until you start to lose teeth and call Thornton Town Center Family Dental today to schedule an appointment or consultation with us.